Patricia Moreno gets your community inspired and on their feet, tuned in to their true desires, and tapped into their limitless potential and self-confidence. Patricia’s talks are based in the latest research in the latest scientific research, her personal life experience and her 30 years of teaching people how to become physical, mentally and spiritually fit. Knowing what to do and actually doing it is what separates people who want to succeed and those who actually do succeed. Self-doubt, fear and uncertainty are the obstacles that can be overcome with shifts in mindset, self-awareness and action. Whether your goal is to have more health, wealth, joy or success, we all have to face our biggest obstacle to improving our life: our own thinking. Audacious Self-Acceptance: Unleashing Your Power to Thrive! We thrive when we’re in a flow state. When we are fully immersed in what makes our heart beat faster and smile more, we tap into our creative genius and joy; and we are fully present and engaged in what we are doing. This is where the magic happens. But research shows that when we are worried about what others are thinking about us or when we are monitoring our looks from the observers’ point of view, it is impossible to reach this flow state, and do our best. It’s proven that when self-objectifying, students do worse on math and comprehension tests, athletes can’t run as fast or lift as heavy and people experience body shame, appearance anxiety, depression and eating disorders. What all of this leads to is a lot of us not doing what we love, fulfilling our purpose and missing out on sharing our gifts to the world. Audacious Self-Acceptance is a method to break the spell of measuring our worth with our weight, caring what other people think and exercising our power to do more, have more and be more. Patricia shares compelling research, personal experiences and stories of people she’s worked with to create a powerful, uplifting and inspiring talk that will engage audiences and leave them feeling like their spirit has been resuscitated. This is not just a feel good talk. Participants will leave with small daily actions they can take to become more audacious, willing show up and be more than beautiful. The intenSati Method: Exercise your Power to Live a Life You Love in a Body You Love! You are more powerful than you think, braver than you seem, and blessed with all you need. The intenSati Method was created by Patricia after dealing with her own personal struggles with eating disorders, drug abuse and exercise addiction. She knows that the one ingredient to living a life you love in a body you love is just that: love. Most of us are feeling stuck, tired and uninspired and wonder why their life isn’t improving. It isn’t because we are doing too much, but that we’re not doing enough what truly makes our heart soar and soul shine! 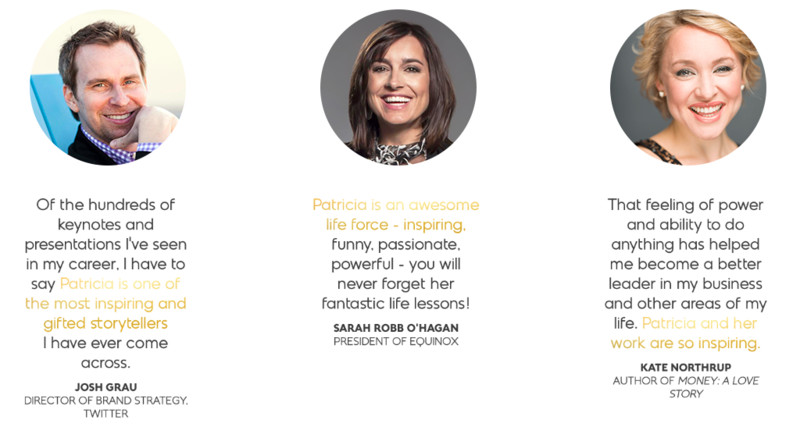 Patricia has been named the soul whisperer because when people hear her speak, they wake up and remember what it is they really want and that they do have all they need to succeed. She is a researcher, teacher and entertainer. She combines compelling research, inspiring real life stories and interactive exercises that have audiences jumping from their seats. Rarely is there a dry eye in the house when Patricia speaks to the hearts and souls of participants. Audiences will leave feeling more than inspired and rewired for more health and happiness; they will leave with real practical tools to will them shift the direction of their life one day at a time. She believes we all have to power within us to live a life we love in a body we love, we just have to exercise it.